Rowan Magazine 55 – Giveaway! Rowan’s latest magazine is now available and I have a copy for you to win! Read on to see if you would like to take part in my latest giveaway! The first few pages of Rowan Knitting & Crochet Magazine No. 55 is packed full of the latest designs photographed on location in the small hilltop town of Vejer de la Frontera on the South West coast of Spain and also in the Moorish city of Seville. How I long for those hot summer days portrayed in these pictures! If you love looking at the pictures as much as you love knitting the patterns there is a small article on Vejer de la Frontera and where the crew stayed for the shoot. The magazine’s designs are created around three stories: Clarity, Legacy and Essentials. This collection is inspired by “the delicate and fragile beauty of historic and contemporary lace and Irish crochet making”. Clarity’s designs are very feminine and romantic but also modern. My favourite designs are Prudence and Trinity. This collection is inspired by Old Islamic and Moorish tile art combined with ancient striated rock formations. 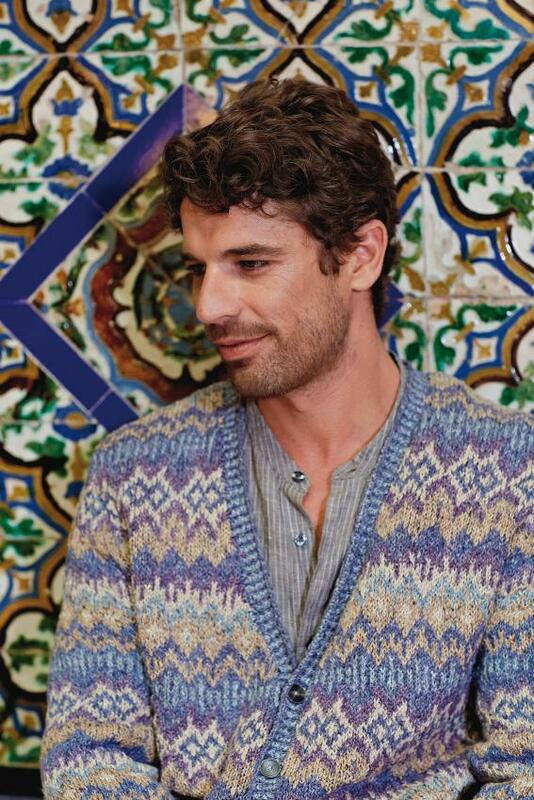 It is full of textural and colourful patterns for both men and women. I can see myself knitting Madia and maybe Fernando for my husband. This is my favoutite collection which features one of the major trends for Spring and Summer 2014: stripes. I love the simplicity of the garment shapes which showcase an array of colourful stripes and zigzags. If only I had an extra two or three pairs of hands I would love to knit Port, Sailor, Buoy and Celeste. If you love Kaffe Fasset’s colourful designs Rowan commissioned him to design an exclusive collection which is pictured in Magazine 55. The patterns are available for download if you are a Rowan member. All together magazine 55 includes 50 designs: 38 patterns in the magazine; 7 Kaffe Fasset designs available to download by Rowan members and an additional 5 patterns to download if you are a Rowan member. However, the magazine also includes many other features: an in depth look into the history of Irish Crochet; an insight into the Knitting and Crochet Guild and their amazing archive; a feature introducing Ann Kingstone’s new book, ‘Stranded Knits’; and interesting facts about linen. Click on the links below to view all the designs from Magazine 55, the online collection and the yarns I have mentioned above. Kidsilk Haze, Cotton Glacé, Purelife Revive, Creative Linen, Summerspun, Wool Cotton 4 Ply, Softknit Cotton. If you would like more information on becoming a Rowan member or opening a subscription with Rowan click on the links below. So, if you’d like to win a copy of Rowan Magazine 55, all you need to do is subscribe to my blog and leave a comment below letting me know which design from Magazine 55 you would love to make. I will pick a winner at random from all the comments left on this post at 12pm (US Mountain Time) on Sunday 2nd February 2014. All package and shipping costs will be paid for by me…..wherever you live. Good luck! This giveaway is now closed! There were in fact TWO lucky winners: Mindy Weaver and Sandra Sundsbo….Congratulations to you both! If you cannot see the ‘Leave a Reply’ box below, click here, and when the new page opens scroll to the bottom. Thanks for reading my blog. If you would like to subscribe please click here. This entry was posted in Rowan Yarns Information, Rowan yarns Knitting & Crochet Magazine and tagged Free Magazine, Giveaway, Kidsilk Haze, Lisa Richardson, Marie Wallin, Sarah Hatton by Esther. Bookmark the permalink. I signed up to subscribe and I am interested in the knit along. Thanks for subscribing Tina……the best way for me to keep you up to date with all the knit-a-long information. I added you to my KAL email list! I am keen to be involved in the KAL. I’ve added you to the KAL email list Susan……thanks for joining the KAL! I would love to join the Knitalong! I’ve added you to the KAL email list Rhian……thanks for joining the KAL! Hi, please notify me about the knit along. Is the materials list available yet? Hi Jo, the materials list has not been released yet but should be in the next two or three weeks. I will be emailing any interested subscribers directly with this and all the KAL information so if you are a subscriber to my blog you will receive an email from me. Thanks for joining the KAL! Please notify me regarding Martin Storey’s Secret Afghan. Have been a subscriber of Rowan since its beginning. Hi Rhoda, I will be adding another blog post in the next day or two with some more information with regards to the Afghan knit-a-long and then will be notify any interested subscribers directly with any further information via email. Absolutely Diane! I’ll be contacted all my subscribers soon with regards to the shopping list for yarn and the start date. Too many beauties to choose just one. Love this issue! Too true Sylvia! I really think this is a good issue…..loads of designs I love! I would love to make anything inspired by the article on Irish Crochet. I found two blog posts from people associated with the article and was wowed by the photos. So I would not favor a pattern per se but would go freeform. Hi Audrey, Rowan’s Knitting and Crochet Magazines are full of great patterns but also some fantastic articles like this one you mentioned on Irish Crochet. Thanks for highlighting this and good luck! I really like many of the patterns in this issue. Particularly Sally and Sailor. I was just looking at these two patterns this morning and would really like to knit both too, especially Sailor. It is made with Softknit Cotton which is a lovely cotton yarn to knit with…..very soft with a fabulous drape! …………which one from the Legacy Collection? Celeste caught my eye because of the retro-vintage feel. And stripes and vintage is apparently on-trend this season too! Eldora – this is my favorite. Knit dresses and tunics are such a favourite of mine so I would love to make Eldora too! I like Celeste and all the other patterns are simply beautiful. It is sometimes hard to choose just one as they are all so lovely! Buoy, as I’m a very nervous knitter with anything more expensive than acrylic, but I trust my crochet skills a bit more! All the styles are beautiful. The crochet designs look great! I would love to make Buoy too and also Madia. I instantly fell in love with the Clarity collection when I first saw it. I even cast on for Divinity. I don’t have much experience with lace weight yet but I’m hoping it works out and I can take more of the projects, like the Prudence pattern as well. Thanks so much for offering a chance to win! It is just a case of getting used to handling Lace weight yarn; you need to hold and work with it gently. The more you knit or crochet with it the easier it is…..as with most things! prudence! The simplicity is hard to resist! This ones on my list too Dian! Wow, I am so impressed! I would choose Sarah Hatton’s and the Irish designs. You make it hard to choose! Good luck, everyone! You can’t go wrong with anything designed by Sarah Hatton…..she is definitely my favourite designer! Oooooo! Congratulations Brenda! Trinity is perfect honeymoon attire! I used Kidsilk haze to knit myself a lace wedding shawl recently and it was so luxurious to wear on the day. I would definitely knit something from the Clarity story as I am a complete romantic! A lace wedding shawl knitted in Kidsilk Haze sounds lovely Ursula. Kidsilk Haze is so perfect for many of the romantic designs in the Clarity collection. There are so many beautiful designs in this issue that t is really difficult to pick just one! Alma is striking, and so that would be my first choice. I love Rowan Magazine. Always a treat. Thanks! What I would really enjoy about knitting Alma is I would get to use 4 different Rowan yarns: Cotton Glacé, Summer Tweed, Revive, Fine Lace! I agree Sue…….Celeste does look like an easy to wear design and it’s so easy to make it your own by changing the colours to suit! God luck! i would make the Celeste cardi. love the look and the yarn they used too. Good luck to all! Great choice Krista……Celeste is turning out to be a very popular design from this issue……..good luck! I really love the Clarity knits. I would definitely make Harmony or Trinity. Kidsilk Haze is one of my favourites. Thanks for offering this opportunity! Kidsilk Haze is one of my favourites too! I love all patterns …. It is so hard to choose Evelyne and the one on the cover……Eldora….is a great one to start with! I could make almost all of the designs in the Essentials Collection! Congratulations Sarah! I hope you do get to knit Celeste and some cute baby clothes too! I really would love to crochet Madia too, and I agree Jennifer…great colours! I love Trinity because looks very sweet, feminine and very cosy at the same time….Also, the perfect combination with distressed jeans! I can see it now Cathy……you’ll look great! I love stripes and jacquard. I will certainly knit Eldoria both for the gorgeous materials and the stripes….. il will just suit all my summer pants! Port or Prudence? That is the question. Hi Jenifer, I love these two also and would like to knit both. I wonder how many designs is it possible for one person to knit from a Rowan Knitting & Crochet magazine before the next issue comes out? I would knit Trinity for my grandaughter as she is having her 24th birthday soon. I love most of your patterns and please start sizing up to a 52 inch bust for women if possible. Thank you for all the wonderful patterns. That will be a lovely birthday present for your grandaughter Maryanne! I will pass your comment about sizing onto the Rowan team. Estonia is stunning! The tunic is beautiful and the color pattern is gorgeous. It is stunning indeed, Linda! I would love to make it in shades of dark blues or purples…..my favourite colours of course! Hanna, you could try buying your yarn online? I have used Deramores and they ship for free…..even to the US from the UK! When I compare across several online yarn stores they always come out the cheapest and they are 100% reliable! I love stripes and so the designs I am going to knit are Wharf, Celeste, and Shore in that order I think, but then I also love Trinity in the beautiful kid silk haze. My first knit will definitely be Wharf though if I have to choose. Thanks for the chance to win this super Rowan Magazine 55 it is certainly packed full with fabulous designs. Well, Cilla, you sound like you will get lots of mileage out of magazine 55……good luck! Well, it is hard to decide between Port, Sailor, and Celeste. I think I would like to make them all. Me too, Debbie, I just need another pair of hands! I would knit Sailor – it would be a perfect piece to see me through the spring and summer. Hi Diane, Celeste is turning out to be quite a favourite design! Promise is really unusual design and I love the scooped hem at the back too! I would give my daughter and daughter in law the choice from the Essentials range, knitting or crochet it doesn’t matter I do both. They would both love the designs and I’d enjoy making them as I love working with Rowan Yarns! That’s so lovely Miriam and how lucky your daughter and daughter-in-law are to have you to knit something for them! There are so many cute patterns in this issue, but if I have to pick one, I’d say Surf would be the one I’d most like to knit. I would love to knit Surf also Kat but I think I would choose different colours like different shades of blue or pinks and purples! Celeste for me! Love the sassy stripes and crisp summery colors pictured above. I love that one too Kunzang….but I might make it in blues or purple colours! I would like to make this in a very pale blue too! I would definitely make Trinity! Absolutely georgeous! It looks so soft, floaty and feminine! Not sure which one you mean Dica? I send a photo of Esperanza, please, see your mailbox, I don´t know how to reply a photo here. Thanks very much, your very kind. Hi Dica, I do apologize…….I see it now! Don’t know how I could’ve missed it…..it’s gorgeous. You could even wear it as a sweater dress! I think I would go for Madia first too Sharine! These two are crochet designs….which surprised me as I don’t normally like crochet made designs…..but I love these! Slovenia is definitely in my que. And it’s knitted using one of my favourite yarns…..Kidsilk Haze. I Love Trinity and Sarah Hatton’s design! Also, would love to receive Rowan magazine 55! I do too Sandra and Sarah Hatton is one of favourite designers! Wow, I never would’ve thought I’d like to make a whole garment out of just Kidsilk Haze but Divinity is beautiful. I have made many garments using Kidsilk Haze Shelley….it’s just beautiful! I think Trinity is going to be a favourite for many! I’d probably have a pattern that I enjoyed, but I am a crocheter, and there are no crocheting choices offered. bummer. Hi Stacy, there are four crochet patterns in magazine 55; go and have a closer look at Geneses, Madia, Harmony and Buoy……they are all crochet patterns. Estonia. For my daughter. She loves Kaffe Fasset’s designs and colours! Might make a good birthday present if I knit fast enough. How nice of you Michelle….and what a lovely present for your daughter! I really like Prudence the best. I may well make this one too if I can find the time! I agree Miriam….although it is a crochet design….hope you are a crochetter? Sailor — absolutely timeless design. Could have been worn at any time from the 30’s and 40’s until now. And don’t we all want the things we knit to be worn forever? It is indeed a timeless design Jennifer. And when you spend so much time and effort making something like these lovely designs you do want to be able to wear them forever. I would love to knit Azerbaijan. Thanks and cheers. And it is knitted using Summer Tweed which is such a great yarn! Love Celeste, simple, clean and colourful! You could make this in so many different colours as Cotton Glace comes in 35 shades! Trinity for me – so pretty, so delicate and so feminine – just like the kidsilk haze. Trinity is so lovely and feminine and I just love Kidsilk Haze…it’s such beautiful yarn!